Happy New Year, readers on the Daily Magi and the Magi Football Blog. 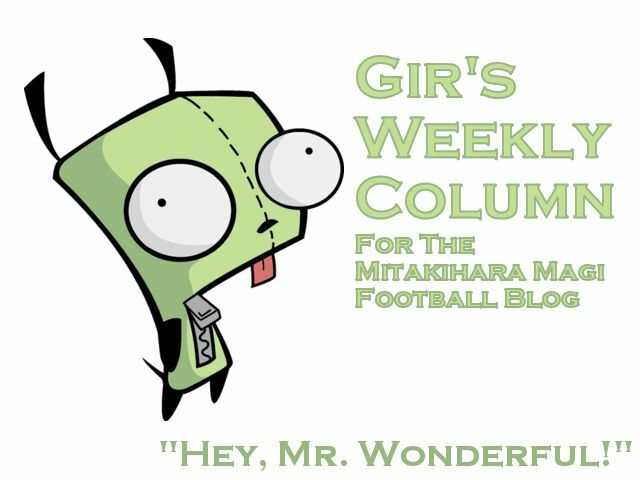 I am, as always, Gir Todafunk with another weekly column. The hour is at hand. The final battle for hope and glory beckons just days from now. And here I am, snuggled up in my hotel room at the Ritz Carlton after days and days of practice and film studying, Nana keeping me nice and warm, blogging from my laptop. I don't need a fireplace to warm me up. I have my wife to do that. Personally. Yes, I have grown up too soon, a.k.a. just at the right time. So what the coaches are telling me and the rest of the players is that it's a rest day. Coach Kaname has this policy: if we are not playing on New Year's Day, we rest. Some of us are going to head to the Rose Bowl Stadium to watch the game, while a small band of Mitakihara alums are going to check out the Rose Parade. The Madoka fans don't really descend into Southern California until New Year's Night. Not to be confused with New Year's Eve. All of the travel packages for members of the Mitakihara Family have been sold out. We used up our allocation of tickets. They were gone in two minutes. Many of the Minnesota fans are staying in Orange County because we had reserved the best rooms in Los Angeles. I mean, when I returned to my hotel room with Nana, I saw nothing but rose, pink and white banners flying overhead, along with the Canadian flag. It was, to put it in more simpler terms, unreal. It put a smile on my face and got me energized for this BCS title game. I knew that everything is set up for us to deliver. We just need to play our game and not mess around. I don't think the coaches need to tell us anything else, other than to tune out the crowd, tune out the pageantry and pomp, and just go out there and deliver. I saw some really good games by the other Mountain West schools, but it terms of talent and quality, we're on a different level. That's been the case all season, and even Minnesota knows they are facing a very tough team, led by The Pig, Takumu, J-Nak, Trey Les, JJ and the Cornerbacks Crew led by yours truly, Mr. Wonderful. In the final weekly column next week, I'm going to give my thoughts on the season and how it's been for all of us. Til then, watch us on TSN and ESPN on Jan. 6 when you have a chance. We won't let you down. We promise. Till then, I'm Gir, signing off. You are not alone.